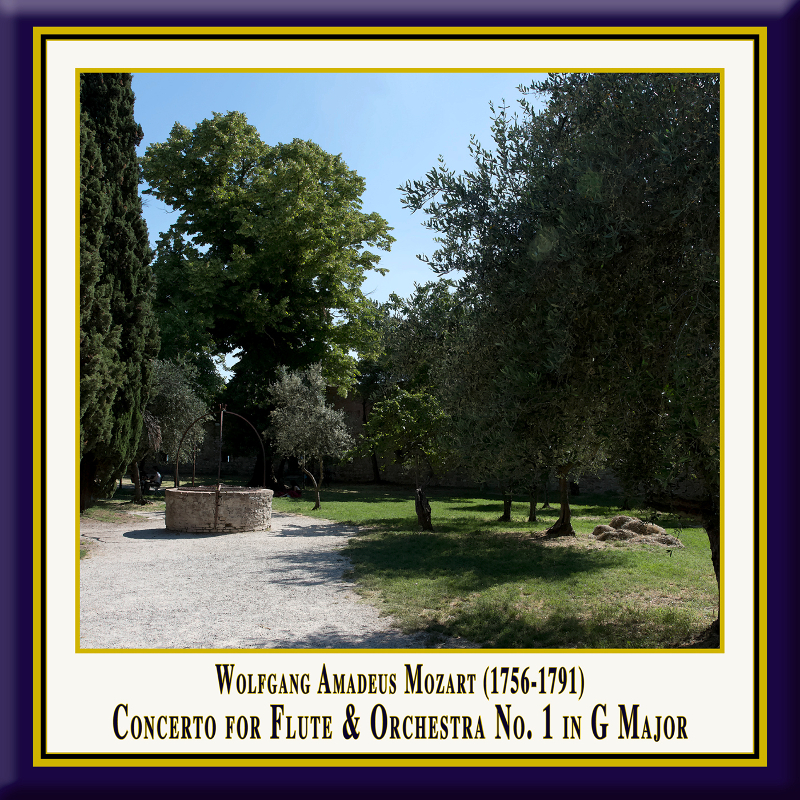 by Wolfgang Amadeus Mozart, performed by Michael Martin Kofler and the South West German Chamber Orchestra. Conductor: Timo Handschuh. ichael Martin Kofler was born in Villach, Austria in 1966 and obtained a Flute Performance degree with distinction at the Vienna Musikhochschule under Werner Tripp and Wolfgang Schulz, as well as studying with Peter-Lukas Graf at the Basel Music Academy.In 1987 Sergiu Celibidache invited him to join the M&uuml;nchner Philharmoniker as Principal Flute. He has been honored with many prizes at competitions (ARD, Brussels, Prague, among others) and was also the recipient of Cultural Endowment Prizes awarded by the M&uuml;nchner Konzertgesellschaft and by the Austrian state of Carinthia, as well as receiving an honorary prize from the Austrian Ministry of Science and the Cultural Prize of his native city of Villach. 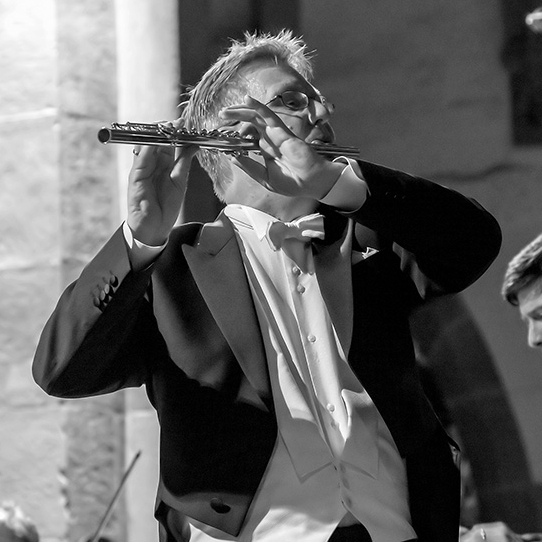 Since 1983 Michael Martin Kofler has performed concertos, recitals and chamber music as a flute soloist throughout the world and has also been featured as a soloist and chamber ensemble member on DVD, CD and in recordings for radio and television. He regularly performs as a soloist with renowned orchestras such as the Academy of St Martin-in-the-Fields, the Australian Chamber Orchestra, the Budapest Strings, the Vienna and Munich Chamber Orchestra, and the Philharmonic and Symphony Orchestras of Munich, Prague, Moscow, Tokyo, Tel Aviv and Warsaw. He has performed as a soloist with conductors such as James Levine, Lorin Maazel, Sir Neville Marriner, Fabio Luisi, Herbert Blomstedt, Frans Br&uuml;ggen, Ton Koopman and Jonathan Nott. His chamber music partners have included Paul Badura-Skoda, Irwin Gage, Stefan Vladar, Stephan Kiefer, Konrad Ragossnig, Xavier de Maistre, Regine Kofler, Martin Spangenberg, Benjamin Schmid, Clemens and Veronika Hagen as well as the Mandelring Quartet and the Mozart Quartett Salzburg. Since 1989, as a professor at the Mozarteum Salzburg Michael Martin Kofler has worked with considerable success with a solo performance master class, and has been invited to important international competitions as a jury member, as well as to teach master classes in Europe, Asia and America. © by www.michaelkofler.de (Version: June 24, 2015). All rights reserved. he hallmark of the South-west German Chamber Orchestra Pforzheim is its fresh and gripping musical approach and stylistic diversity from early to contemporary music. The ensemble consists of fourteen musicians of seven different nationalities and is one of the few full-time chamber orchestras in Europe. This allows for exceptional richness and flexibility of sound, which is maintained even when the Orchestra is enlarged with further wind or string players. The ensemble was founded in 1950 by Paul Hindemith's former student Friedrich Tilegant. Soon the ensemble won international recognition: One talked of the "Tilegant-sound", which could not only be heard at the festivals in Salzburg, Lucerne and Leipzig as well as on world-wide tours, but which was also documented on numerous recordings. Maurice André, Dietrich Fischer-Diskau, Frans Brüggen and Yehudi Menuhin are only a few of the celebrity names who have worked with the Orchestra. After the Tilegant-era, which ended far too early after the premature death of its founder in 1968, the Orchestra was moulded by the Viennese Paul Angerer (1971-1981), Vladislav Czarnecki (1986-2002), who came from the Czech music tradition, and Sebastian Tewinkel (2002-2013). To shape and develop sound, style and program in the future Timo Handschuh has assumed the position of the orchestra's music director with beginning of the concert season 2013/14. On its road to success the South-west German Chamber Orchestra has made numerous broadcasts for almost all European radio stations and released nearly 250 records and CDs, many of which were awarded international prizes (Grand Prix du Disque, Monteverdi Prize, Prox Artur Honegger). Several premiere performances (Jean Françaix, Harald Genzmer, Enjott Schneider) prove its competence in contemporary music. Currently the Chamber Orchestra plays together with renowned soloists such as Gidon Kremer, Rudolf Buchbinder, Christian Tetzlaff, Sabine Meyer, Frank Peter Zimmermann, Mischa Maisky and Anatol Ugorski. Together with them - but also with up-and-coming young musicians - the Orchestra has been invited to perform in all European countries as well as in the USA and Japan. Ideas for new programmes beyond the traditional subscription concerts extend the ensemble's profile. In 2001, the South-west German Chamber Orchestra toured Europe's great concert halls with Giora Feidman and Facundo Ramirez, playing Klezmer and Argentinian folklore (Misa Criolla), and the ensemble continues to tread new paths with American violinist Monique Mead to win young audiences for classical music ("Classic for Kids"). The Orchestra recently recorded a newly composed score which was mixed with original soundtracks of the Comedian Harmonists and performs other projects of chamber opera, dance (Flamenco with Nina Corti) and marionette theatre.